Before George Winston became a world-famous pianist known for his mellow, melodic instrumentals, he was a sociology student at Stetson from 1967 to 1970. Winston was, he confessed, “really studying music all the time, more than regular school,” and he would “sneak into Elizabeth Hall” at 3 a.m. to play its majestic pipe organ. The musician behind such acclaimed albums as “December” and “Winter Into Spring” also did get some real-world sociology experience during his Hatter days. “The Neighborhood Center of West Volusia was started by Nora Hagman in the late ’60s, and I was one of the volunteers,” Winston said. “We’d find people out in the sticks and deliver cardboard boxes full of food,” Winston recalled in February prior to his concert on the Stetson campus. Call it part of Winston’s own personal journey. 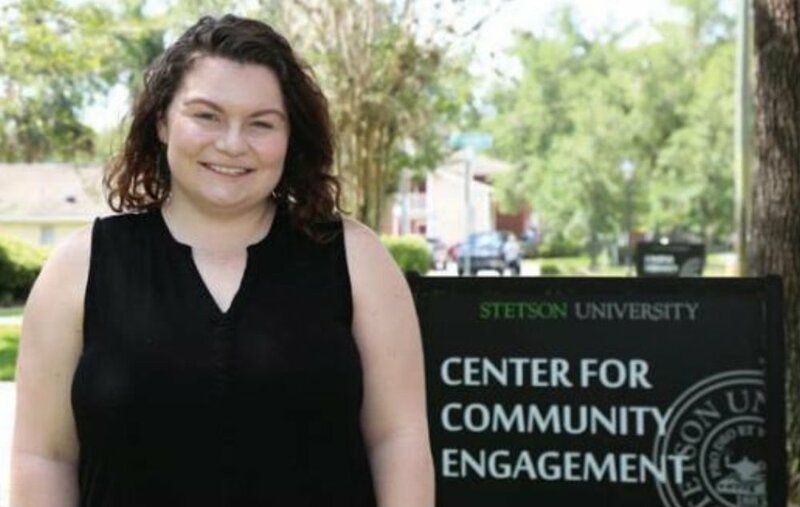 Members of the Stetson community helped to establish The Neighborhood Center, affirmed Amber Finnicum-Simmons ’16, community impact coordinator at Stetson’s Center for Community Engagement. “Not to say that Stetson gets all the credit, but there were faculty and staff who worked hard,” she noted, citing that Gary Maris, Ph.D., former dean of the College of Arts and Sciences, was among the initial founders. Notably, before joining the Center for Community Engagement, Finnicum-Simmons was a Bonner student who began volunteering at The Neighborhood Center in 2012 and has been “connected to them ever since,” she said. Now, she’s also pursuing a master’s degree in clinical mental health counseling at Stetson and recently completed a three-year term on The Neighborhood Center’s board of directors. Homelessness has been part of her journey, too. Today, nearly a half-century since initial involvement, the Stetson community’s efforts to combat homelessness have expanded dramatically. Those efforts range from face-to-face encounters while serving the homeless at The Neighborhood Center — located just one mile south of Stetson’s campus — to face-to-face policy discussions in Washington, D.C., with legislators and staffers at the U.S. Department of Housing and Urban Development. Other Stetson activities include food, furniture and vital-equipment donations to The Neighborhood Center, a book drive for children at shelters, an annual conference on poverty and homelessness, a pending study of how local law enforcement interacts with the homeless and more. Current students are sharing much of the same sentiment, embarking on their own journeys and adventures to help combat homelessness. Their involvement was amped up in the mid-2000s with the establishment of two new programs at Stetson: The Center for Community Engagement and the Bonner Program. Even as years pass and the paths taken by students twist and turn in fickle, fateful, incalculable directions, The Neighborhood Center remains a focal point, with its shelter and food pantry, and hope. That’s how Jason Cruz ’17, Bonner Scholar, English/philosophy major and former editor-in-chief of The Stetson Reporter (the university’s student newspaper), met Bob. “I was interested in storytelling as a therapeutic method, and I was interested also in having the people who were using these services speak directly and not having someone speak for them,” Cruz said by phone from Philadelphia, where he tutors full time at a middle school as a City Year AmeriCorps member dedicated to public service. In his booklet’s introduction, Cruz wrote: “In my time at The Neighborhood Center and other sites working with homeless or impoverished people, I have found that one thing lights up their faces faster than anything else. That spark comes when others take genuine interest in them and treat them as equals. It happens so rarely in their general experience that when it does, they become ecstatic. After a year-and-a-half absence from the center, Bob returned one day. Copies of “Stories From Our Neighbors” are archived at Stetson’s Bonner Program, and Cruz gave the original files to The Neighborhood Center “in case they want to print more or continue this project in the future,” he said. Students’ boots-on-the-ground volunteering at The Neighborhood Center “really impacts our agency in a big way,” asserted Waylan Niece, operations director of the center. Five students contribute a total of 30 volunteer hours weekly. The students work at the front desk and answer phones, bag food for clients, assist clients with paperwork and enter vital data into computer spreadsheets, enabling center staff to pursue other duties. 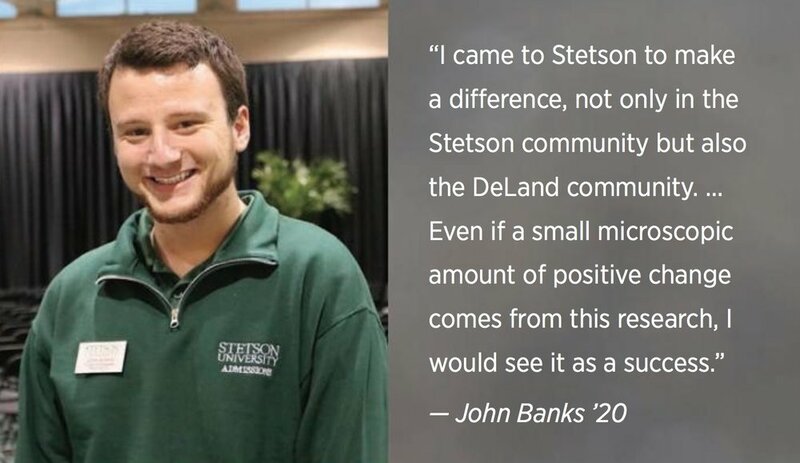 As part of a research project, John Banks ’20 will collaborate with the center, along with Stetson’s Department of Sociology and Anthropology and the Bonner Program, to examine how law enforcement in Volusia County interacts with the poor and the homeless. Banks seeks to eventually present his findings to the DeLand City Commission and Volusia County Council. Banks wants to build a career in criminology or criminal justice, a pursuit that began in grade school and was nurtured in the Bonner Program. At what’s called the Sweet Spot Workshop, a meeting designed by the Bonner Program to match students’ career goals and academic interests with community needs, Banks learned of the opportunity to engage with The Neighborhood Center and conduct research. A discussion with his academic adviser, Sven Smith, Ph.D., assistant professor of sociology, along with Niece and Finnicum- Simmons, cemented the idea. Such is the beauty of the Bonner Program, Banks and Finnicum- Simmons agree. The annual Poverty & Homelessness Conference, a collaboration among Stetson, Volusia County Schools and Volusia United Educators, was founded four years ago by Rajni Shankar-Brown, Ph.D., the Jessie Ball duPont Chair of Social Justice Education at Stetson. The conference aims to address the “devastating effects” of poverty and homelessness on school-age children, Shankar- Brown said. The conference included a panel with schools sharing the impact of action plans created at past conferences, like creating food pantries and clothing/hygiene closets, developing educational workshops for families living in poverty, and re-examining curriculum and instruction to meet the diverse needs of low-income students. “I believe that we have a civic responsibility to address poverty and homelessness, and when I say ‘we,’ this includes higher education,” said Shankar-Brown, who is an elected board member of the National Coalition for the Homeless. She frequently travels to Washington, D.C., to discuss homelessness and poverty matters with members of Congress, the U.S. Interagency Council on Homelessness and HUD. “One of the reasons I decided to join Stetson’s faculty is because of where it is situated. Knowing there are significantly high numbers of children and youth experiencing homelessness in Central Florida is deeply distressing and further motivates my work as a social-justice scholar-educator,” Shankar-Brown added. Using a point-in-time method, Volusia County Schools identified 2,006 students as homeless as of January 2018, out of a student population of 63,000. Of those students, 191 were considered “unaccompanied homeless youths, meaning they do not live in the custody of a parent or a guardian,” noted Jennifer Watley, the school district’s homeless liaison/foster care contact and a member of the Poverty & Homelessness Conference’s planning committee. “I am determined to help change this painful reality and encourage my students to engage and be ‘solutionaries’ in a world of growing disparities,” Shankar-Brown said. Throughout Stetson’s Department of Education, future teachers are taught how to recognize signs of homelessness in their classrooms. Homelessness also is a personal issue for Shankar-Brown. Her father immigrated to the United States from India with a full scholarship to attend Howard University in Washington, D.C., but room and board were not covered. When Shankar-Brown’s mother joined him, they were homeless and lived in cardboard boxes and under bridges. By the time Shankar-Brown and her siblings were born, their parents had established a stable household. The Volusia/Flagler County Coalition for the Homeless conducts a point-in-time count each January by sending volunteers into the community with surveys to be filled out by homeless people encountered. Those surveys are then combined with data taken from the Homeless Management Information System database through HUD. The 2018 count for Volusia and Flagler was not available as of this writing. The 2017 count was 753 homeless people, according to the coalition’s website, vfcontinuum.org. Other efforts to address homelessness come from throughout the Stetson community. Last year, Shankar-Brown worked with members of Stetson’s Student Coalition to End Homelessness and the university’s Pi Beta Phi Fraternity for Women to hold book drives that collected more than 3,500 books for local homeless shelters and high-poverty schools. Stetson’s Dining Services donates leftover food to The Neighborhood Center. Facilities Management donates surplus and used furniture or kitchenware, left over from renovations, to the agency for use in its housing program. Stetson’s Sarah George Trust Fund grants funds to better DeLand’s Spring Hill neighborhood, giving preference to projects that involve Stetson students and result in a lasting community impact. Greenfeather, now a student-driven philanthropy program of the Center for Community Engagement, supports numerous local nonprofit organizations through fundraisers and donation drives. Greenfeather originated in 1952 on campus. In 2015, a Greenfeather grant was awarded to The Neighborhood Center. Through all of this, the Center for Community Engagement has played a chief role, certainly not alone, but as a leader. “By being a member of this community, we have a responsibility to leverage as many resources as we can to reduce poverty and solve some of these big issues that we have the full capacity to be able to support,” Finnicum-Simmons commented, also pointing to Stetson’s Office of Career and Professional Development. For students, it’s a case of helping self by helping others, Finnicum- Simmons described. 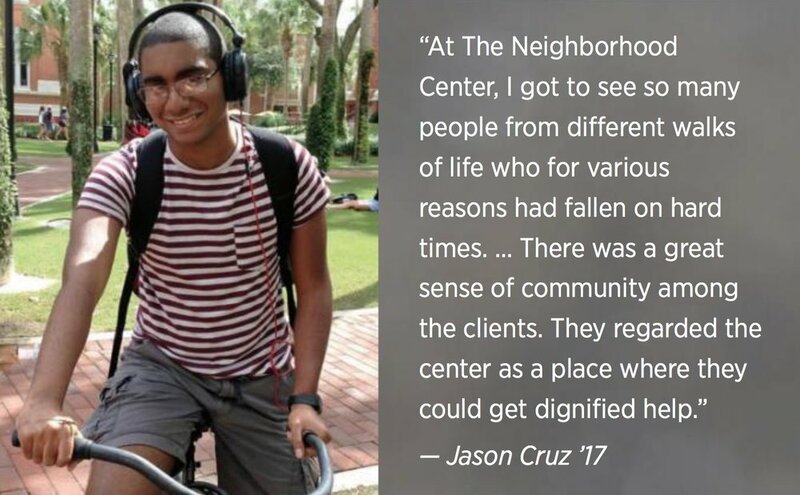 Among the goals of the Center for Community Engagement is to “make sure that every student at Stetson has some kind of community-engagement experience. We’re at about 68 percent right now,” she said. The engagement brings change to students, just as it makes a difference in the community. For Cruz, the writer-interviewer behind “Stories From Our Neighbors” as a student, the fruits of those efforts continue to grow after college. “People in poverty, people in issues of housing scarcity are just as kind and generous and loving and resourceful as anyone else,” Cruz reflected. “Oftentimes, we as a society will neglect these people. We’ll leave them off to the wayside, or assume that there’s some sort of moral failing and that’s why they’re in the situation they are. “At The Neighborhood Center, I got to see so many people from different walks of life who for various reasons had fallen on hard times, be it families who had a medical situation that cost them their money, or people who were escaping violent situations. All of them in my time there were kind to me, kind to each other. There was a great sense of community among the clients. They regarded the center as a place where they could get dignified help. They weren’t sneered at or looked at as some sort of parasite, but were treated as people who deserve respect.